Look at this picture and tell me what you see. An abused dog? A neglected dog? A dog that deserves a better home? 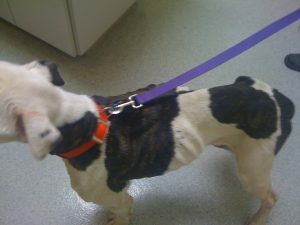 This photo is of Otto, an American Bulldog and he is most definitely loved and NOT neglected or abused! The above photo was taken in an emergency vet’s office after Otto was humanely captured in a dog trap. He had been “lost” for two months during which time his family was frantically trying to recover him. Otto lost 33 pounds (he went from 90 to 57 pounds), but he is currently recovering from his terrible ordeal. Here’s his story. Otto was traveling with his Daddy on an Interstate in Arkansas when they were involved in serious car crash. Sadly, Otto bolted from the crash in raw panic and would run from anyone who tried to capture him. Ultimately the sightings dropped off and his owner had to continue on with his move to Houston, Texas. But then during the 7th week Leslie Mann, an avid animal lover just passing through the area, sighted the skinny white dog in the middle of a heavily vegetated median on the same Interstate where the accident took place. Leslie did some detective work and discovered that this dog was likely the missing dog Otto. She called the owners in Houston as well as Missing Pet Partnership in hopes of finding a pet detective who could help in the recovery. Pet Detective Lisa Bukowczyk from The Feline Finders lives in Little Rock, Arkansas. Although Lisa’s business title sounds like she only works lost cat cases, she is a certified Missing Animal Response Technician with Missing Pet Partnership and takes on dog cases as well. Among her services, Lisa offers “Trap and Reunite” (TAR) which are highly effective techniques (attract, detect, then capture) used to recover panicked lost cats and dogs. Lisa responded immediately and met with Linda, Rob, and Margarita (Otto’s human family who drove 8 hours from Houston,) to plot out a recovery strategy. 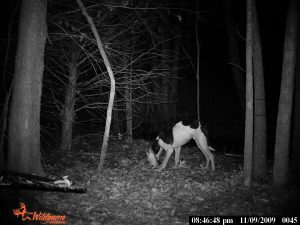 First, they set up feeding stations accompanied with digital wildlife cameras in order to verify whether or not the dog sighted was really Otto and to condition him to come back for a source of food. The strategy worked, because within two days they captured a very skinny Otto on camera! Everyone was elated to discover that the skinny dog that Leslie spotted was, in fact, Otto! Next, Lisa set up a large dog humane trap and slathered it with peanut butter and dog food but locked it open with a bungy cord (so the door would not close). This was to make sure Otto would not be afraid to enter the trap. They left it tied open for 3 days until he willingly entered the trap. He wasn’t afraid. He was hungry and he licked the trap clean! On the fourth night they actually set the trap and were hoping for the best. Margarita returned to the trap at midnight and Otto was inside! She called Lisa for help to lift the dog and the cage into the back of her van (not risking letting him out of the trap and escaping again). They rushed Otto to an emergency vet where he was treated, released, and taken home to Houston to be loved on and pampered. The most important aspect of this story that I’d like to share is that when you find a stray dog that looks terrible – a dog that looks starving or has injuries – please remember Otto’s Story. Understand that the skinny, panicked dog that you found might be a loved companion animal who looks awful because he’s been on the run for weeks, or even months. Because Leslie Mann did not assume that the skinny dog that she saw was “dumped” or “abused,” Otto was reunited with this family! Leslie did what we wish all rescuers would do…she assumed that the skinny dog was LOST, not dumped or stray. For info on how easy it is to mistake a panicked, lost dog for an “abused, neglected dog” (and even a panicked, lost cat for a “feral cat”) visit Missing Pet Partnership’s Think Lost, Not Stray page. In addition, there are simple actions that you can take when you find a stray dog to increase the chances of reuniting a found lost dog with their family. Thank you to Leslie Mann and the other unsung-lost-dog-recovery-heroes for making a difference!